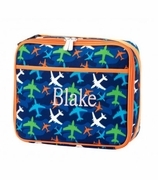 Boys shark lunch tote. 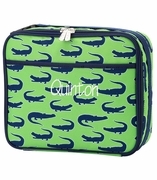 Just arrived, shark pattern lunch tote bag in navy and white. A lightweight easy clean inside and out carry all for school lunches, trips to the park or travels in the car when snacks are necessary. The design of the bag is neat and simple with a handle and side water bottle holder.. An extra storage pocket on the front is ideal for small items.